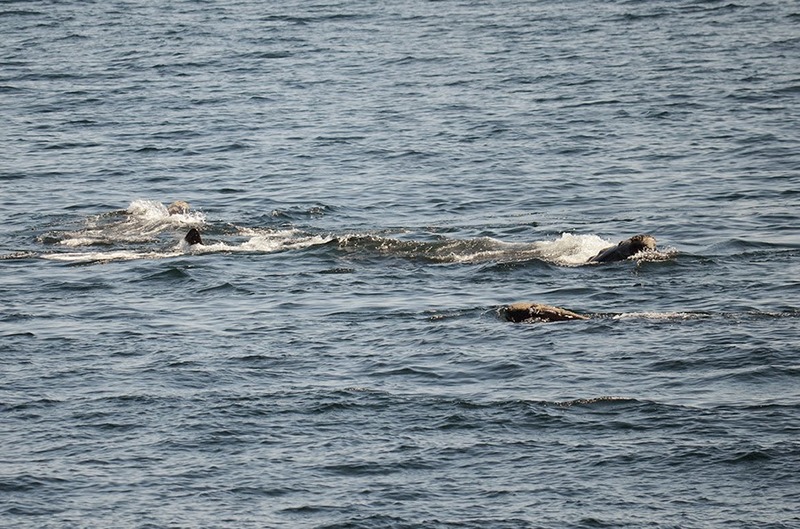 “Best day of my life!” was something that my fellow naturalist said on Saturday’s morning whale watch. We started the morning on the northwest corner where we saw a lot of gannets but no evidence of the whales that had graced this area just the day before. 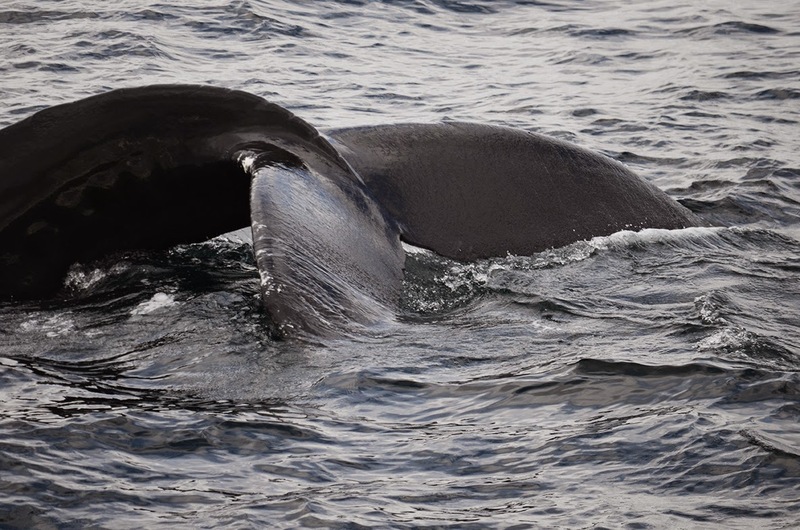 We spotted a blow and when to investigate and found a whale which was spending a lot of time just below the surface and constantly changing direction which we quickly deduced was an unusual and exciting sighting for the area: a sei whale! After a little while we decided to leave this whale and head farther south and came across a second sei whale also exhibiting this typical behavior. Sei whales feeding can be an awesome sight to behold (see the sighting log for Monday April 27) but unfortunately for us these seis just weren’t in the mood so we continued south in search of more whales. 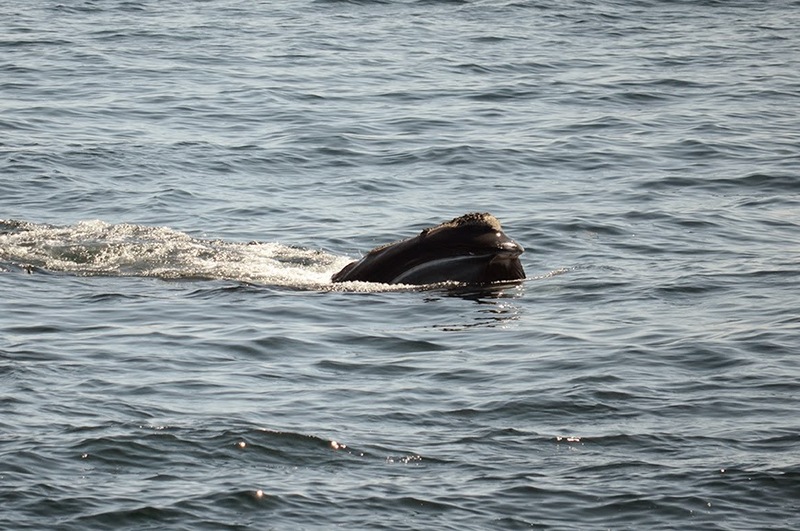 Right whale skim feeding, it's baleen is very visible in this picture! Our captain informed us that another whale watch boat had found whales far to the south and we decided to head that way to investigate. Early spring is not the time of year to get anywhere fast on Stellwagen Bank. 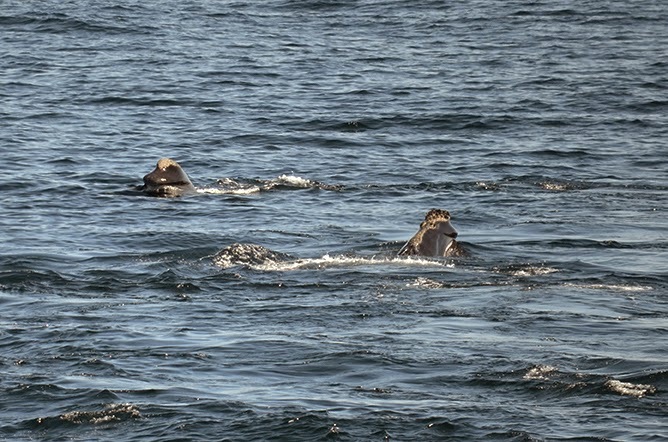 Seasonal speed restrictions are in place until early to mid-May in many areas to protect the critically endangered North Atlantic right whale so traveling 9 miles at 10 knots is a very, very long trip. As we got closer to the area the other boat had reported whales in we started to see blows and our spirits were definitely uplifted. We headed for the first animal we saw and when it surfaced I zoomed in on my camera to get a good shot and noticed the characteristic callosities, patches of roughened skin colonized by whale lice, of the North Atlantic right whale. It was incredibility exciting to see one of these amazing and endangered whales! Realizing it was a right whale and not a fin whale as originally suspected we moved away and suddenly there was a group of right whales skim feeding. 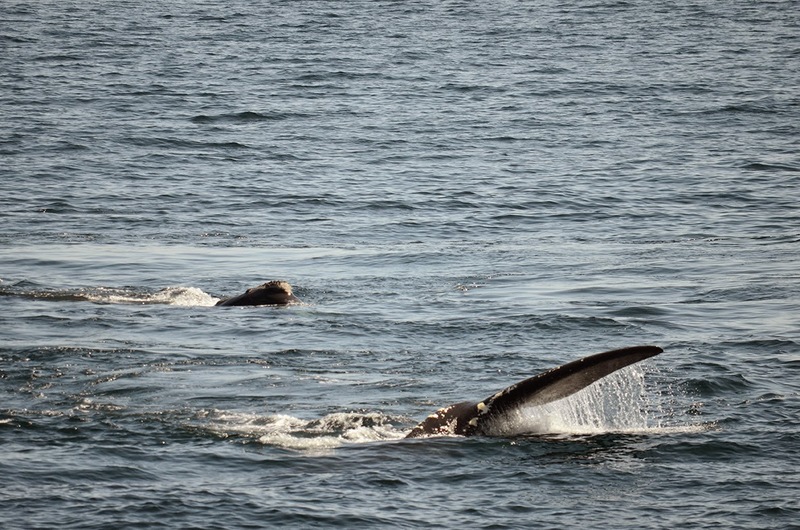 We were overjoyed to have seen one right whale, imagine our reaction at seeing four! Right whales eat copepods, small zooplankton about the size of a grain of rice. Unlike humpback and fin whales, right whales don’t have grooves on their throats that allow the skin to expand when they engulf prey. Instead right whales keep their mouths open and plow through the patches of copepods. The water enters through a gap between their racks of baleen and flow out through the sides, a bit like how a fish’s gills work, and the very long wispy baleen captures the prey. Right whales sometimes “mow the lawn” and move back and forth through patches of prey which is exactly what we were seeing these four whales do. This gave me a great opportunity to get photographs of all sides of the head which researchers can use to identify the individual right whales. With such a small population size, only around 450-500 animals, it’s important to get as much information as possible about the whales that are here and what they’re doing. It was an amazing once in a life time trip and I know that I will always remember it. 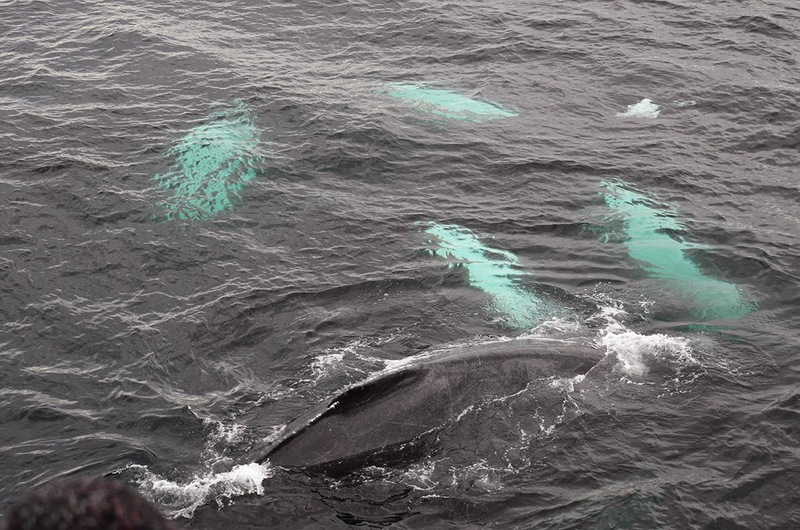 Saturday’s afternoon trip was more typical for Stellwagen Bank but no less impressive. We headed out to the northwest corner where whale watch boats from Gloucester had found some humpback whales. The skies had clouded over since the morning and it was much more dramatic setting for a whale watch. As we approached the center of the bank we could make out blows all along the eastern edge but with the speed restriction in place it was just going to be too hard to get to them with enough time. We decided to stay with a trio of whales that ended up putting on quite a show. We identified old favorites Geometry and Aswan and thought we’d identified the third whale as Falcon but have since realized that unless Falcon grew a new dorsal fin, he wasn’t our third whale! None the less, my favorite part of the trip may have been the underwater “pile up” we witnessed. 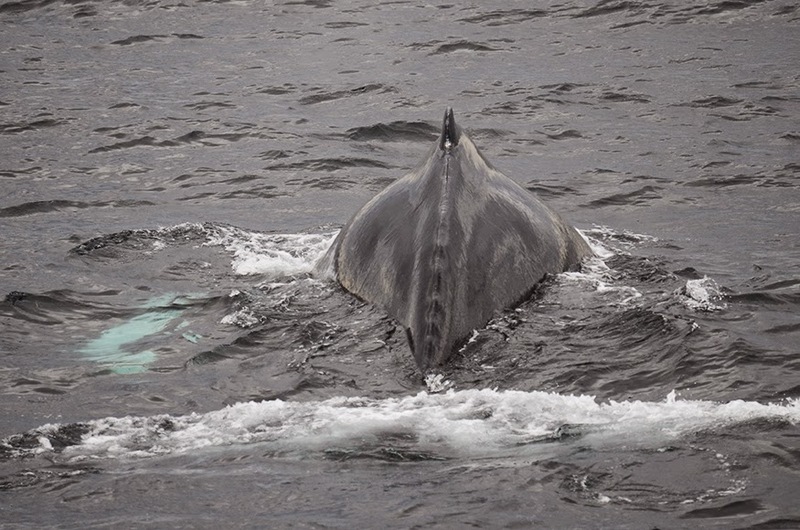 We could see all three whales below the surface, pectoral fins glowing, but all the whales seemed a bit piled up and it was difficult to guess which pectoral fins went with which whales. It all was a perfect end to a perfect day on Stellwagen Bank.